Guests at Zoombezi Bay enjoy a movie while relaxing in the water. It’s a whole new park after dark during Zoombezi Bay Summer Nights, presented by Swedish Fish, as the Powell attraction lights up the night and offers guests an extended stay at the Bay until 11 p.m.
Beginning at 6 p.m., guests can watch their favorite central Ohio waterpark transform as the sun goes down and their favorite attractions become even more thrilling in the dark. Some favorite rides and attractions, including the all new Otter Banks area, Cyclone, SoundSurfer, Big Boa Falls and more, will be open until 11 p.m. for thrill-seekers to enjoy some extra splash time in the park. In addition to having access to Zoombezi Bay’s many attractions after dark, Otter Banks will host live entertainment, including music, animals from the Columbus Zoo and Aquarium and friendly character ambassadors to entertain guests of all ages. Swedish Fish samples and activities will also be available. After an invasion of the Bergens (miserable creatures who only feel happiness after eating a troll), Poppy and Branch join forces to rescue their friends. While the two are an unlikely match, with Poppy’s enthusiasm and Branch’s pessimism, their mission is full of adventures and mishaps as they attempt to work in harmony to save the day. Following a ghost invasion of Manhattan, paranormal researcher Abby Yates and physicist Erin Gilbert join forces to prove to society that ghosts do exist. They enlist the help of nuclear engineer Jillian Holtzmann and subway worker Patty Tolan to prepare for an epic battle against the supernatural. In order to save a once-grand theater fallen on hard times, dapper koala Buster Moon strives to preserve the theater by producing the world’s greatest singing competition. Animal singers come from all corners to step into the spotlight and dream big in the name of saving the theater from ruin. Follow the adventures of Buddy the Elf as he travels all the way from the North Pole to be reunited with his father. Along the way, Buddy spreads Christmas cheer to every cynic he meets with his childlike antics. This thrilling animated movie follows Batman as he tries to save Gotham from the clutches of the Joker. In order to save the city, Batman must learn the importance of teamwork alongside his superhero sidekick Robin and loyal butler Alfred. Regular admission rates apply for each Summer Nights event, but guests who visit Zoombezi Bay after 5 p.m. on the night of the event and use the code phrase, “Swedish Fish Tropical,” at the ticket booth will receive discounted admission for $10 per person. After 8 p.m., guests using the code phrase will receive $5 admission per person. 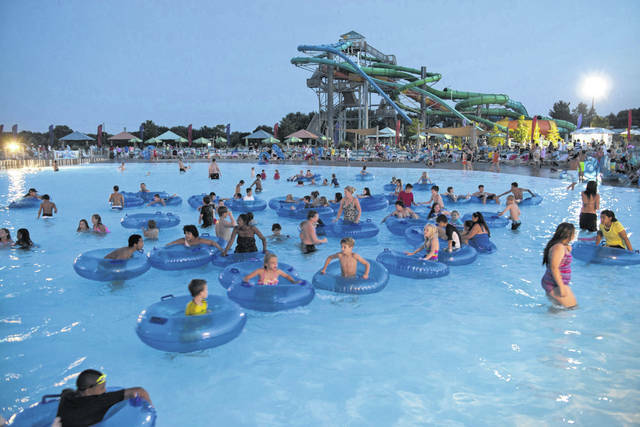 Those who follow Zoombezi Bay on Facebook will have the chance to enter to win a Family 4-Pack each week leading up to each Friday’s Summer Nights event. For more information or to purchase Zoombezi Bay admission tickets and season passes, visit www.zoombezibay.com. Zoombezi Bay is a 22.7-acre water park that features 19 state-of-the-art water attractions, including the aquatic adventure area, Otter Banks; themed water slide, SoundSurfer; the multi-level play structure, Baboon Lagoon; a wave pool; an action river; a lazy river; a kiddie play pool and more. Admission to Zoombezi Bay includes the Columbus Zoo, and proceeds from the water park support the Zoo’s operation and mission. Please visit www.zoombezibay.com for more information.